Confession time: Some days I don’t want to do school. Even though I love teaching and learning with my kids, I lack the desire to do formal education. I don’t want to pull out the math books or try to get them to remember what we learned about history yesterday. Burnout, sickness, cabin fever. We all have these seasons in our homeschool and sometimes the cure is to take a break. Mom needs a rest. The kids need a change. Whenever these breaks are needed though, I’m not worried about them not doing formal because they will still be learning. Breaks don’t mean T.V. or video games all day. When the breaks come, creating a learning environment in your home means you kids are still learning during the breaks. Creating a learning environment means that our kids will opportunities to discover, create, tinker, and experiment on their own. 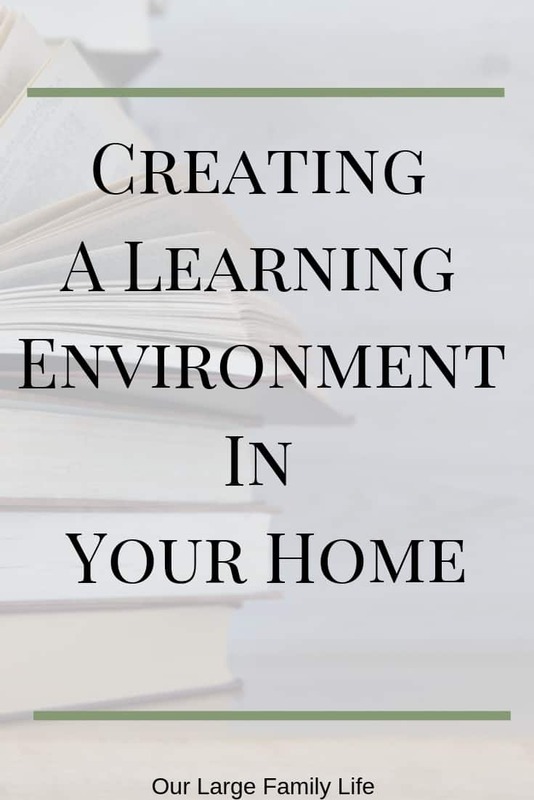 So what kinds of things do you need to create a learning environment? Books are my number 1 way to create a learning environment in our home. Building a home library allows your kids to find things that interest them and the ability to learn at the same time. I have one child especially who loves animals so anytime I’m at a book sale and see a book on animals I always pick it up. Having a wide range of books means there is a greater chance for your children to find something they love. A wide range of books available allows your kids to discover them for themselves. They can find new things that are interesting to them or learn new skills. Another good thing to stock up on are puzzles. These are especially great for my younger kids who don’t do much school yet but need something to keep them busy while the older kids do their school. You can find easier ones for little ones and harder ones for older kids. When we work on a big puzzle I have a puzzle board that stays in my room so the puzzle doesn’t get wrecked when they can’t finish it in one sitting. I’ll admit this is the hardest one for me, probably because it makes the most mess. But life is messy, isn’t it? While we seem to have a never-ending supply of paper, pencils, crayons, and colored pencils, I’m hesitant to go beyond that will small kids. We had glitter once. That’s the end of the story. We also do watercolor paints as well. I like having things the kids can get to by themselves that do require additional help from me. Having books on hand that teach them how to draw or paint will also help them to develop their skills. Music is a great way to add to your children’s learning environment without them even knowing. You can have all kinds of music playing in the background during the day. I find that music playing is a great mood booster, especially if you live in places where there is a long cold winter. There are also a number of different online programs for your children to take music lessons. If you have instruments in your home this is a very affordable way for your children to experiment in learning the basics of music instruction. These are toys that have no set instructions so your children can play with them any way they want. Legos, blocks, cars, kitchens sets, train tracks, are great toys that kids can make up as they go along. They use their imagination to build and play. If you have the ability for your kids, nature one of the best environments for them. If you’ve never read, Last Child In The Woods by Richard Louv, I highly recommend it. Observing the world around them is a great way to study nature. They are able to explore, observe, and interact with nature instead of reading about it from a book. They will gain a greater understanding of how the world around them works. Outside is one of the best classrooms for your children to explore the world around them. There are so many skills they gain from being outside. It’s also where their imagination can truly work. Board games add to learning as well. They learn to follow directions. Most games have elements of counting and strategy in them as well. This allows kids to use the skills they have been learning in school. If they are really into games they could even create their own game. Creating their own game would use a ton of skills through designing the game and writing rules. Costumes provide a whole new level to imaginative play. And they make school work more fun. 😉 A great way to find cheap costumes is to buy them after Halloween or check out Goodwill. Even better, they will want to gather materials and make their own. Creating a learning environment allows your kids to have the space to develop into their own persons. It also means when life happens your kids are still learning even when you aren’t doing formal book work. There are so many different ways that children learn. Providing them with the resources means they can learn what is inspiring them and what they are interested in. This means you don’t have to stress about learning when you are already stressed-out. What are your favorite ways for children to learn? « Work From Home Job or Home Business: Which Is Right For You?